A testament to the goodness of humankind, Akira Kurosawa’s Red Beard (Akahige) chronicles the tumultuous relationship between an arrogant young doctor and a compassionate clinic director. Toshiro Mifune, in his last role for Kurosawa, gives a powerhouse performance as the dignified yet empathic director who guides his pupil to maturity, teaching the embittered intern to appreciate the lives of his destitute patients. Perfectly capturing the look and feel of 19th-century Japan, Kurosawa weaves a fascinating tapestry of time, place, and emotion. When the Criterion release of Red Beard appeared on my doorstep, I can’t say I eagerly embraced it. 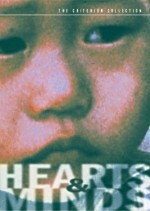 A three-hour Japanese flick about doctors who work in a poor community didn’t exactly scream “must watch” to me. Had Beard come from any Japanese director other than Akira Kurosawa, I probably would have skipped it, but his reputation managed to entice me. And I must admit that in regard to Kurosawa, I could go by nothing other than his reputation. 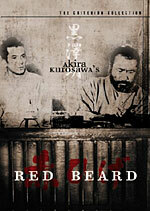 I’m embarrassed to admit it, but before I screened Red Beard, I’d never seen a Kurosawa flick. No Seven Samurai, no Ran, no Rashomon - not even Hidden Fortress, even though it constituted a major influence on Star Wars. To take in Red Beard as my first Kurosawa experience seemed like a risk; maybe I should have tried one of those potentially more accessible flicks first. As it happened, my fears were unfounded. I have no idea how I’ll react to Kurosawa’s other works, but I found Red Beard to offer a deft and compelling drama that worked well for most of its running time. Red Beard features a deceptively simple plot. New doctor Yasumoto (Yuzo Kayama) comes to a run-down clinic in a poor area against his wishes. Forced to work under clinic head Niide (Toshiro Mifune) – known as “Red Beard” due to his, uh, red beard – Yasumoto initially resists his assignment and refuses to cooperate with co-workers and guidelines. However, as time progresses, he gets more caught up in the atmosphere and starts to develop a true interest in the clientele. Nothing about the story of Red Beard stands out from the crowd, and the synopsis I offer may sound like a very thin framework for a three-hour film. However, Kurosawa manages to make something marvelous from the basic tale. Amazingly restrained, the director never indulges in the sentimental and melodramatic concepts that could sink the film. Instead, he treats the subject matter and the characters in a wonderfully calm and simple way. Beard packs a lot of issues into its running time. From the way in which society treats its poor to the development of Yasumoto to detours into the lives of patients, the film remains low-key but it takes on a mix of topics. These flow in and out of the narrative effortlessly. Not until after the fact will you realize that Yasumoto’s tale gradually evolves into the story of an abused 12-year-old geisha named Otoyo (Terumi Niki), and we then move easily into the life of street urchin Choji (Yoshitaka Zushi). The alterations never feel forced or abrupt; as I mentioned, I didn’t even realize they occurred, as the movie consistently transitions smoothly and naturally. Kurosawa maintains a control over the project that allows these changes to succeed. Character growth also seemed very concise and believable. Yasumoto goes from spoiled brat to caring physician with grace. The movie packs no obvious revelatory moment for him. Some of his experiences seem more equal than others, but no one action causes him to alter his personality. That’s as it should be, for few of us change our personalities based on one event alone. Kurosawa shows great respect for the characters via this subtle and realistic presentation. They reward him with strong performances. Despite his name in the title, “Red Beard” is really a supporting character in the film; he never becomes its focal point. 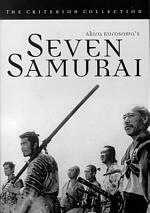 However, due to the nicely restrained and authoritative work from Mifune, he feels like the movie’s center. The cast all embrace the understated nature of the project and turn in performances that match it well. Too many flicks that examine the medical community seem melodramatic and simplistic. We find junk like Patch Adams that touts easy answers and totally avoids any tough questions. Red Beard feels like the absolute antithesis of that kind of superficial junk. The movie treats its topics with sublime realism and naturalism and creates an engrossing environment. Compelling and moving, Red Beard provides a rich and involving piece of work. Red Beard appears in an aspect ratio of approximately 2.35:1 on this single-sided, dual-layered DVD; the image has been enhanced for 16X9 televisions. Despite a few small concerns, Red Beard usually looked terrific. Sharpness seemed excellent. At all times, the movie remained nicely distinct and well defined. Softness caused no noticeable issues during this tight and concise presentation. Jagged edges and moiré effects presented no problems, but I did notice some light edge enhancement at times. In regard to print flaws, a few of these occurred, but not many given the age of the film. Light grain showed up at times, and the image also appeared a little flickery at times. Some examples of specks and streaks also appeared, and I noticed a few running vertical lines. These issues never seemed very intrusive, however, as the defects stayed minor throughout the movie. The black and white image showed terrific delineation in those domains. Black levels looked deep and bold, and contrast seemed accurate and solid. Shadow detail came across as clear and appropriately dense without excessive opacity. Ultimately, Red Beard provided a very satisfying visual experience. The Dolby Digital 4.0 soundtrack of Red Beard also worked very well for a film of its vintage. For the most part, the soundfield remained fairly anchored in the center channel. Music demonstrated decent stereo spread, and some environmental elements also showed up in the side speakers. Surrounds kicked into action mainly during some of the film’s showier scenes, such as during a landslide or a windstorm. However, Red Beard offered a fairly stark soundtrack, so not many of these moments occurred. Audio quality appeared good for its age. Since I don’t speak Japanese, I can’t evaluate the intelligibility level of the speech, but the lines seemed reasonably natural and warm. Effects sounded somewhat thin but they replicated the material fairly well and lacked any substantial distortion. Music showed decent fidelity and dynamics and appeared clear and tight. The mix suffered from a little hiss but usually sounded clean. Red Beard presented a very solid soundtrack given the period in which the movie was made. Red Beard includes a few supplements, but only one significant item. That would be an audio commentary from film scholar Stephen Prince. He provides a running, screen-specific affair that offers a tremendous amount of information. Clearly working from well-prepared notes, Prince covers a wide variety of topics. He relates details about Kurosawa’s career and life as well as interpretation of Red Beard itself. We also hear about connections to other works – with a particular emphasis on Dostoyevsky’s The Insulted and the Injured – and get a great deal of useful notes that deal with the production. Despite the long running time of the film, Price rarely pauses; almost no empty spaces occur as he fills the movie with facts and remarks. Prince offers a very solid commentary that helps educate and illuminate the listener. In addition, the DVD includes the film’s trailer. Presented non-anamorphic 2.35:1, the clip runs a lengthy three minutes and 55 seconds. Interestingly, it tosses in some behind-the-scenes shots along with the usual movie snippets. Lastly, inside the DVD’s booklet we get notes from film historian Donald Richie. Though not as rich as the tome included with Hearts and Minds, Richie provides a nice general overview of the film and the production. While I don’t know if Red Beard is the best place for viewers new to the work of Akira Kurosawa to start, I think it offers a very solid film. Actually, I’ve seen none of the director’s other work and I really liked Beard, so perhaps it is a nice beginning point, though I’d imagine some of his other movies may be more accessible. In any case, Red Beard provides a rich and compelling drama that manages to remain involving for its entire three-hour running time. The DVD boasts very good picture and sound quality as well as a solid audio commentary. Kurosawa fans should delight in this excellent release, and others less familiar with the director’s films should consider it as well.